Synexus is dedicated to conducting clinical research studies and has been investigating the effectiveness of new medicines and treatments for more than 20 years. Synexus provides a friendly relaxed environment where you may have the opportunity to help medical developments in studies designed to assess the safety and effectiveness of an experimental therapy, to assess whether the new intervention is better than standard therapy, or to compare the efficacy of two standard or marketed interventions. 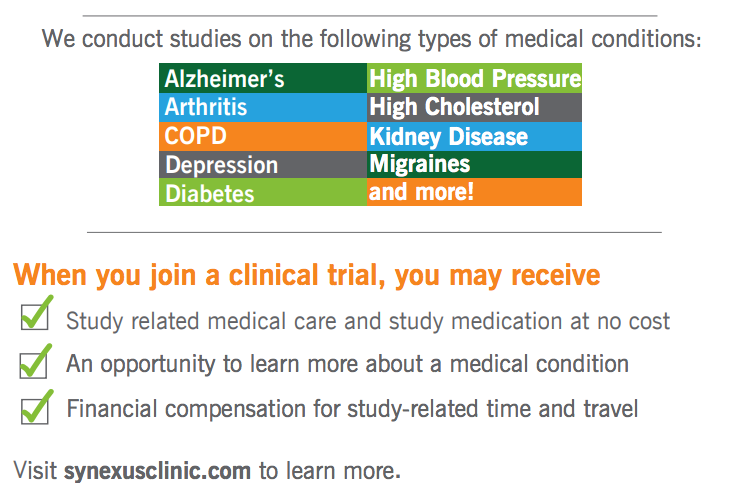 Tatum Highlands Medical Associates and Synexus have teamed up to conduct clinical research studies within our office. Our experienced and professional research team is here to assist with your health care needs. Please contact our research office at 480-585-1790 today to find out which study opportunities we have available for you.